I received an e-book copy of this novel in exchange for an honest review. An Lee is pregnant with her second child when the Japanese begin bombing her town in China. Her husband is off fighting in a war that seemingly never ends, leaving her in care of her mother, step-mother, and children. Through the food shortages and enforced curfews, she finds herself joining an anti-Japanese group–something her husband would never approve of. An Lee sees death, war, and hatred all around her, but must keep it together for the sake of her family and husband, if he ever returns. I really wish I could say that this book was fantastic because the ideas behind it were well-thought out and intracate. Unfortunately, Tiger Tail Soup read more like a series of events than like a book with an actual plot. Once I reached the halfway point, I realized that there still was no major climax or central issue/conflict. This was definitely an interesting read…but I didn’t really get the point of the novel. That being said, I also felt like the author was telling me things instead of showing me. I don’t feel like I got to know An Lee very well, because her actions were merely described to me. For example, Nicki Chen writes about how much An Lee misses her husband throughout the entire book, but I never got any more proof of that other than the author’s word. I wish this, what I imagine to be, intense longing and grief over a missing husband had been shown instead of told to me. 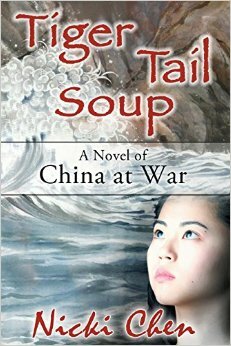 I still enjoyed reading Tiger Tail Soup and learning more about what the war was like for people living in China circa 1940. Nicki Chen definitely played with my emotions with the novel. I found myself both grieving and celebrating along with An Lee.